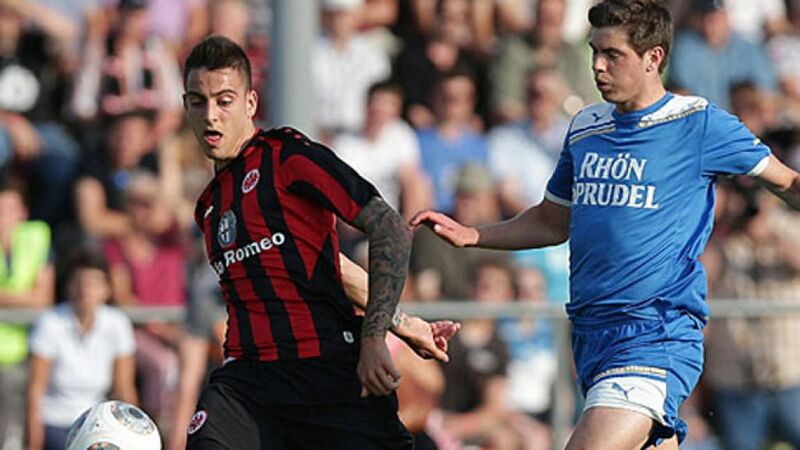 More of the same for Eintracht Frankfurt in 2013/14? Frankfurt - Having spent much of last season in the top four, freshly repromoted Eintracht Frankfurt eventually had to 'settle' for sixth place in the table, and with it a qualifying shot at the group stages of the UEFA Europa League. After an extended period of underachievement, the club from Germany's fifth-largest city has given its huge fan base righteous grounds for hope that, just two years on from a disastrous second season-half spiral into direct relegation, the seeds have been sown for a sustained assault on the top end of the Bundesliga. And at least as importantly, under Armin Veh's charge, Eintracht are again finally playing football with the style and flair for which they were once renowned, both at home and considerably further afield. So is this the start of a long-term revival of one of the country's great traditional clubs, four-time winners of the DFB Cup who, in 1980, brought the UEFA Cup back to the metropolis on the Main? The notoriously difficult second season back after promotion will likely deliver some telling pointers as to the true measure of Frankfurt's seemingly stellar progress. For one thing, the team faces the challenge of competing on an added front and given that players and fans alike are desperate to make their presence felt once again on the international stage, there is little sense that success in the Europa League would at any stage come to be viewed as a "burden" to be borne on top of the domestic agenda. The question is, however, having come up through the ranks so swiftly, do Eintracht already have the strength in depth for such a potentially arduous itinerary? The club have signed former Germany U-20 keeper Felix Wiedwald as back-up to No1 Kevin Trapp, and defensive all-rounder and Philippines international Stephan Schröck, the latter from Bundesliga rivals 1899 Hoffenheim. It is further up the pitch, though, that Veh is looking to really ring in the changes. On the back of a great season with SC Freiburg, Johannes Flum has come on board with the Eagles. Nominally a holding midfielder, the Freiburg youth academy graduate is very much one in the creative mould, as amply demonstrated by his two-goal contribution to the recent training camp friendly win against Turkish top-flight outfit Bursaspor. Likewise freshly arrived from Freiburg, Jan Rosenthal is equally at home marauding down the left or playing in the hole behind a lone frontman, while former Spain U-21 international Joselu, another arrival from Hoffenheim, albeit on an initial one-year loan deal, adds an undoubted touch of class to the forward department. Veh has made no bones about his desire to get another striker on the books sooner rather than later and all-in-all, the signs are that the coach is continuing to pursue the bold attacking policy which has served him so well in his first two years at Frankfurt. The team suffered an inevitable form dip over a fairly lengthy stretch of the second season-half as opponents wised up to their tactics, but they held their nerve and form well enough to claim that altogether unexpected European prize. Full-back Sebastian Jung, whose early-season form earned him a call-up to the senior Germany squad last November, pinpoints the team's "great common bond" as one of the keys to their recent success - alongside the contribution of Veh, who "has always encouraged us to play our own game." That philosophy will once again be tested to the full when, in tandem with their Europa League play-off assignment, Frankfurt kick off a Bundesliga season which sees them on the road for four of their opening six games. The two they have at home, for good measure, are against FC Bayern and Borussia Dortmund.